Before you swing open the colossal glass door into Hendrix, step left to see the gleaming Doregrill French rotisserie rotating succulent meats as they drip savory juices on fingerling potatoes below. It’s a seductive come-on and encouraging evidence that this kitchen has a sensual streak. Teeming with natural light and coastal breezes, Hendrix swaggers into Laguna Niguel with a 180-seat domain that promises something for everyone in the option-lean suburb. Open since April, it’s the newest and largest restaurant from SRHG, the local team—including chef Rainer Schwarz—behind Laguna Beach’s The Deck and Driftwood Kitchen. The Austrian-born Schwarz is executive chef here, too, where his menu is more expansive, due to plenty of kitchen space for ongoing exploration and tinkering. The kitchen is big enough to supply baked goods for all three restaurants. 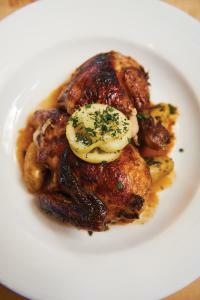 Though fairly seasonal, the menu at Hendrix offers many steadfast, less season-dependent options. The rotisserie meats—chicken, pork, and lamb—are enduring players, and they’re augmented by dishes that hint at Schwarz’s roots. Precious little spaetzle can be had in these parts, but here the fresh, squiggly egg noodles, offered under Soups, Salads & Spreads, are essential to a standout muffin that combines them with smoky, chewy Nueske bacon in a warm dish accented with cool burrata and blistered cherry tomatoes. This seemingly simple combination tastes like “More, please.” Dreamy as well are the delicately breaded fritters that bind San Daniele prosciutto and roasted chicken morsels with béchamel. Just don’t tell your cardiologist you heard it from me. Dip them into honey-grain mustard aioli for sweet-salty balance. Brussels sprouts are an upgrade to the flood of mundane versions. Marcona almonds, dried cranberries, and mint-spiked yogurt add lively complexity to these bittersweet orbs. Rotisserie meats get top billing, but the four-pound chickens—glistening from faithful basting with lemon juice, herbs, and good olive oil—are easiest to love. Juicy inside, bronzed outside, they’re served as a quarter bird or on a platter with all three meats. All include “drip” potatoes, golden-fleshed fingerlings from Weiser Farms, but only chicken comes with preserved lemon confit. Tart, sweet, and sharp, the relish lights up every forkful it touches. Porchetta—a brined pork belly traditionally seasoned with garlic, herbs, and liberal salt, then wrapped in skin before roasting—fails to beguile. Here, the skin is hoof hard, seasoning is difficult to detect, and the meat isn’t tender, so it doesn’t meld with the pork fat. Porchetta sliders are a better bet, enhanced by peppercorn-apricot jam and crispy onions. The lamb sandwich with tzatziki looks delicious, but the typically mild Colorado lamb is assertively gamey on my try. My leftovers never made a second appearance. 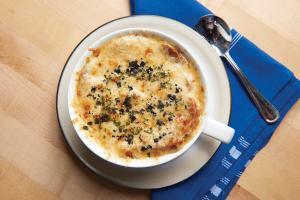 Potato garlic soup is silken and fragrant, but surprisingly bland. On nippier nights, trust a commendable onion soup with deep, caramel notes and the classic partner, Gruyère cheese toast. For now, goodbye to those impossibly tender squash blossoms stuffed with ricotta, and the juicy tomato and watermelon salad with flowery fresh basil. Beautiful northern halibut with fresh corn sauce? See you next summer. Expect brawny new dishes the equivalent of a bear hug. Examples not available for tasting for this review include Prime beef short ribs with parsnip puree; wild mushroom risotto with creamy corn sauce; rotisserie Prime beef with creamy horseradish lebni; and a rotisserie vegetable platter for two that is sure to please the veggie set. For not-so-heavy fare, there’s a worthy flatbread featuring buttery crust under pesto, fontina cheese, Asian pear, and pulled chicken. The house salad is a novel mélange of roti chicken, goat cheese, tiny tomatoes, avocados, and dates—a California salad that satisfies like a meal. Cozen’s catfish—named for the restaurateur pal who steered Schwarz to the aquafarm source—is skillfully fried in fine cornmeal that doesn’t smother the mild flesh, and the zingy lime-cilantro side slaw is spot on. 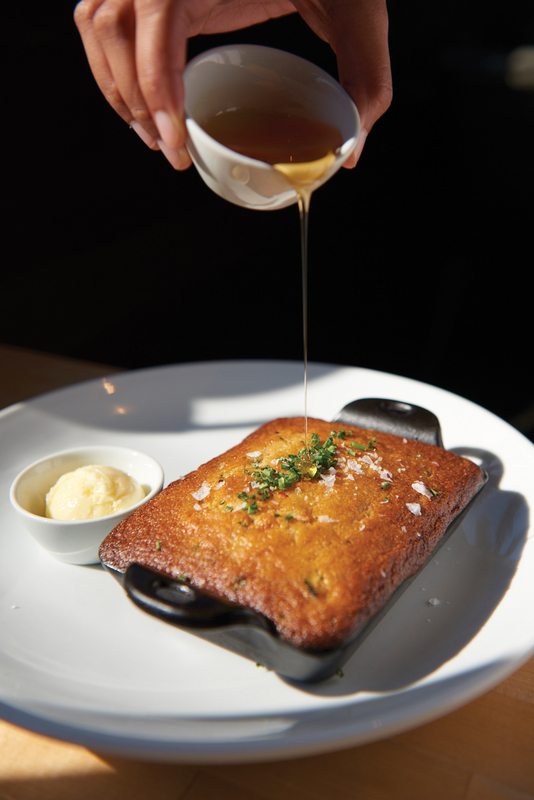 Weekend brunch and happy-hour menus offer lighter fare. Brunch’s lemon-ricotta pancakes are feather-light, and the Berkshire Benedict is almost buoyant—the thinly shaved ham, delicate muffin, and textbook Hollandaise make it the best in town. Happy hour’s discounted snacks and craft drinks already have a solid following at the centerpiece bar, 4 to 6 p.m. Monday through Thursday. A mix of seating heights and nooks makes the voluminous space feel more inviting. Curved and comfy cerulean blue booths seem the coveted spots for viewing the action. Tables for two near open casement windows with a treetop view are also alluring. Service is reliably accommodating, and servers know their stuff. A miniboutique of 90 wines with bulk discounts saves a trip to nearby Trader Joe’s, and four kid-friendly meals include a beverage and ice cream, final confirmations this spot is more of a local hang than destination restaurant. A hint of Europe, lots of California flavors, and a coastal vibe that always feels welcoming, Hendrix games a lot of appealing angles in one convenient venue. What local can say no to that formula?